This article contains Arabic text, written from right to left in a cursive style with some letters joined. Without proper rendering support, you may see unjoined Arabic letters written left-to-right instead of right-to-left or other symbols instead of Arabic script. 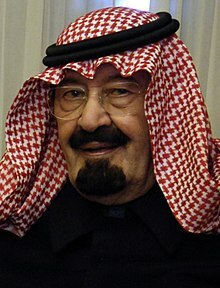 Abdullah bin Abdulaziz al Saud, (Arabic: عبد الله بن عبد العزيز آل سعود‎‎ ‘Abd ullāh ibn ‘Abd al-‘Azīz Āl Su‘ūd) (1 August 1924 – 23 January 2015) was the King of Saudi Arabia from 1 August 2005 until his death in 23 January 2015. He became king upon the death of his half-brother, King Fahd. He was the tenth son of Ibn Saud. Abdullah died from complications of pneumonia at the age of 90. His half-brother Salman took his place as king. ↑ "King Abdullah bin Abdulaziz". Saudiembassy.net. Retrieved 18 June 2012. ↑ "King of the Kingdom of Saudi Arabia". Saudi Arabia: Ministry of Higher Education of Saudi Arabia. 4 August 2010. Retrieved 28 June 2012. ↑ "Kingdom Kings". Saudi Arabia: Ministry of Commerce and Industry - Kingdom of Saudi Arabia. Retrieved 28 June 2012. This page was last changed on 4 February 2015, at 01:33.